This book, Learning with The Mother should have come out before my other book, Growing up with The Mother. In the year 1971, I had made a compilation in French of most of these texts, which also included a short introduction of the Green Group classes. When I offered that French compilation for publication as a book, the Mother herself gave the title for it, as La Mere traville avec les infants (The Mother works with the Children). 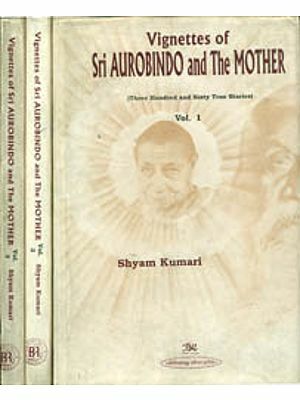 The compilation was corrected by Andre Da and given to the Ashram press for printing by the Mother Herself. Unfortunately, it was published only after the Mother had left Her body. When I joined the Sri Aurobindo Ashram –Delhi Branch, many of the young sadhaks and teachers wanted me to get could follow the Mother's method of teaching. 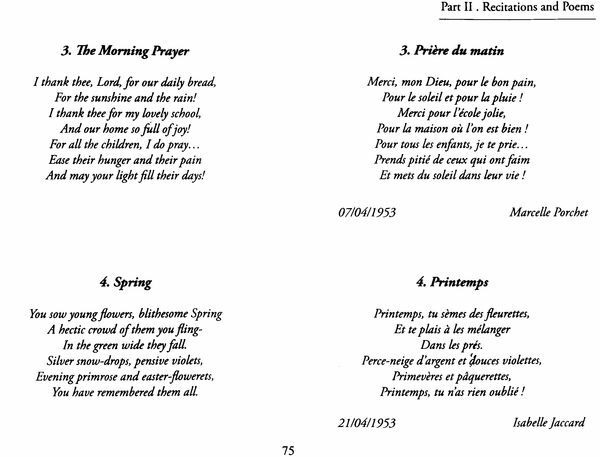 It was easier to put together my correspondence with the Mother which has been partly printed in French for which the Mother had given the title, Reponses de la Mere a une nonitrice. For the English version, the book was largely expanded and I gave it the title Growing up with The Mother. This book was published in the new millennium 2000 which heralded a new light and force. 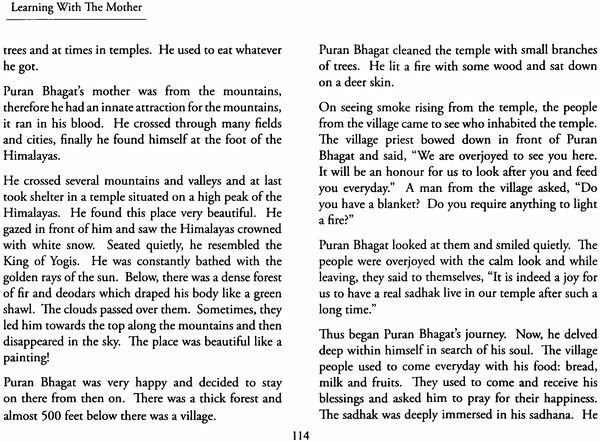 Learning with The Mother is the title which I have given to this book. This was long overdue and something on which I had started working more than 25 years ago. Taking decisions on certain issues was most difficult for me. "Should we put only Mother' handwritten dictations or should I research from the other children's notebooks and make a complete compilation?" was one big question. However, this is what I finally managed to do. The same question arose with the collection of recitations that the Mother had assigned. Several years passed and I could not made a complete collection of them inspite of my best efforts and research. 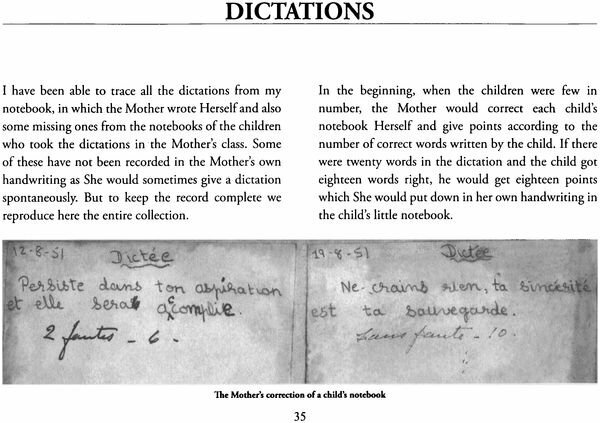 Although the chapter on recitations probably has all the items, I am not sure which ones the Mother used for the class and which She did not. The next difficulty came with the compilation of stories that the Mother took up for the Friday classes. 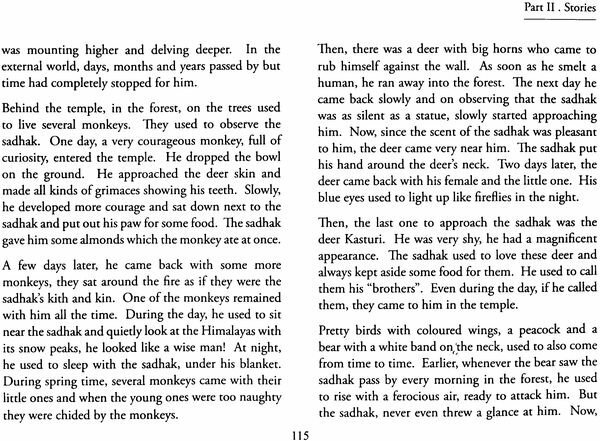 I got quite a list of the stories from Mrityunjaya Da's notes but his taking of notes also started almost two years after the Mother's class. I then started hunting for the original books from which the Mother had read the stories. My brother Promesse (Kake) also help me and we found some books but the collection was so incomplete that I could not make up my mind whether to forget about it or to continue with my efforts. Hence more delay. Finally we have the titles of most of the stories which have been preserved for archival work, but we are not placing them in the book. Due to all these reasons, it has taken me a long time, with short and long intervals of no work on the project owing to other work pressures. I am still not very happy with the final outcome and I feel that I could have done better id I has recorded everything myself during the Mother's classes. It could have been a wonderful compilation. She was an ideal teacher and ever while teaching simple subjects, She would touch every level of the child's inner growth. The first part of this book contains the guidance of the Mother to a young child on leadership, character building and helping to arouse an aspiration for constant progress with simultaneous development of the inner life. The ideal and the goal She always put before us was progress, progress, progress and perfection in all that we did. Although I did not understand it then but I now realise that through her detained day to day guidance and continuous showing of her blessings, holding my hand and guiding every step of mine, she was preparing me for my future work and the heavy responsibilities I was to shoulder later in life at the Sri Aurobindio Ashram – Delhi Branch. Over the years at every difficult moment I have felt Her boundless love and affection carrying me in Her arms and leading me towards the eternal light, urging me to aspire towards a clear perception of my mission and protecting me from all adverse forces, difficulties and internal and external ups and downs of life so that I may move unhindered towards the goals She set before me. I offer this incomplete and imperfect work at Her Lotus Feet, praying that She will forgive me for my lapses and shortcomings. I would also like to thank all those who helped at every stage, patiently & enthusiastically, with the successful realisation of this project. 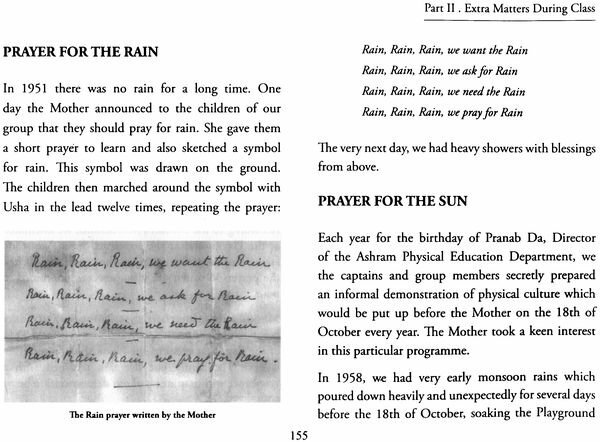 This part of the book covers the Mother's work, from 1950 to 1955, with the youngest children of the Ashram. During these years, She met them to teach French. It is interesting how these classes started. We, the captains of Group of Group A who supervised the physical education activities of the children, of ages four to twelve, usually spoke to the children in English or 'Ashram Hindi'. But sometimes we spoke in French, for that was not only the Mother's native language but also the official language of Drench Pondicherry. 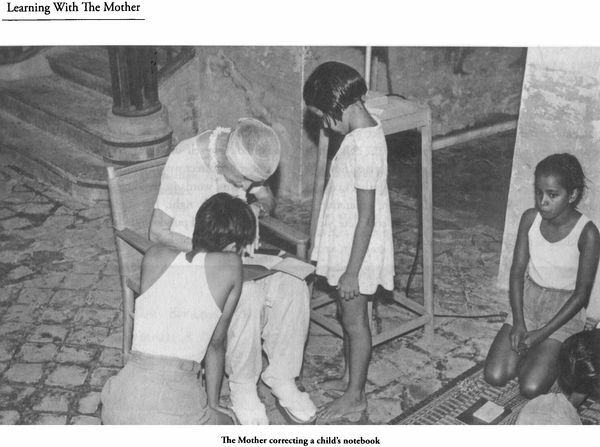 It was at the time the medium of instruction in all Pondicherry schools, including the Ashram school. Among the locals of P9ondicherry, hardly anyone spoke or understood English. Towards the end of 1950, we the captains of Group A, discussed the idea of speaking only in French with the children, so that they as well as ourselves, would learn the language faster and become more fluent. Consequently, we approached Mother when She came to the children's courtyard for the daily distribution of groundnuts and told her of our plans. She was very happy to hear this. Spontaneously She decided that She too would give a few moments every evening to speak in French with the children. On 17th November, 1950, the classes finally started. Mother: "What is your age?" Child: "My name is Kokila." Mother: "And what is your name?" Child: "I am eight year old." The Mother laughed, for the child had answered mechanically in the order in which she had learnt to say her name and age. The following day, the Mother announced she would conduct regular French classes for the children. On 19th November, she brought the first lesson, a typed sheet with the picture of a bee drawn at the top. She sat in her chair in the children's courtyard, with the children all around her, and gave the first lesson on the bee. She explained words. When the class was over She handed over the sheet with the lesson of the bee to me since I was the captain of the group. Thus she made me the monitor of the class under her personal guidance. From that day on, I sat on the floor next to her chair, and helped with calling out the names of the children and maintaining the record successful recitations and dictations on a little chit pad. The record was used for giving prizes and awards to the children. I due course, as monitor of the class I was given a wooden Almirah, which was kept in the verandah of the Guest House. The Mother also gave me a small chit pad on which she had written the names of the children, one on each page. Besides the notebook and stationary for the class, I kept in the almirah a lot of little toys, photographs, framed pictures, pencils, erasers and other gifts that Mother handed me from time to time. Whenever she something interesting for children, she would just pass it o to me and I would put it in wooden almirah. She used these little gifts as prizes in the class. Each time a child would note down a dictation correctly or recite a passage without a mistake, she could mark a tick against the child's name. When 10 such ticks were marked, she would give him or her a prize. She would ask me what was available, and then would select something from prize for the child, but most often She would also write the name of the child, write Her blessing and sign the prize before She gave it. Many of the prizes were created by Suren Da, an elderly ashramite who could not go to any department for work because of his health. He used to collect extra prints of photographs from the bulletins in the Press and cut them out to make interesting combinations with pictures from other magazines., For example, he once made a card of mother standing among the snowy peaks of the Himalayas. Mother particularly enjoyed a card of herself feeding a Lion. He would frame these pictures with glass from broken panes and fix cardboard stands at the back. I still have some of these from the collections of my sisters & brothers, Chitra, Purnima, Promesse and Victor who won them as prizes. Thus she trained me not only to organise things but also to take care of all material objects without wasting anything and to remain always conscious of the need to progress at all levels and at all times. Remaining close to her physical presence for long periods daily, brought out spontaneously the best out inner and outer beings. 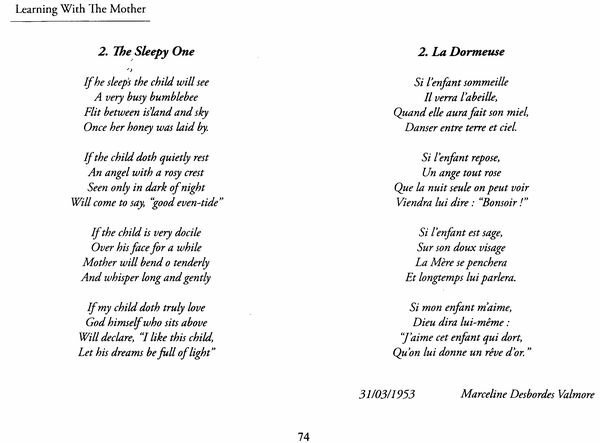 By the time She had finished four of these lesson in the children's French class, the Mother got busy preparing for the Darshan on 24th November. Even after that She could not resume the classes because Sri Aurobindo's health was deteriorating. 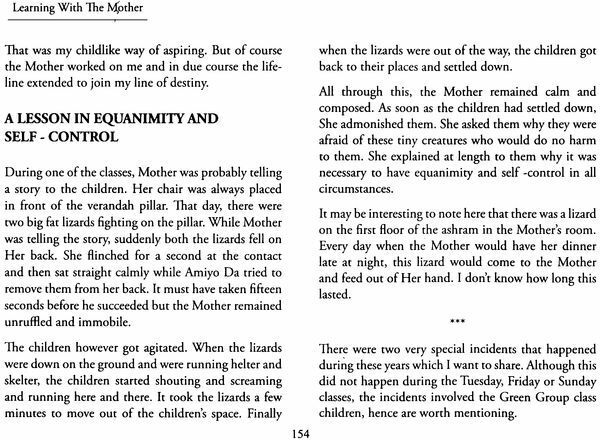 On 5th December, 1950, Sri Aurobindo tool Mahasamdhi, The Mother did not emerge from room for 12 days after that. From 17th December, 1950, Mother resumed Her daily routine. She also restarted the French classes and at this point She took up her book "Tales of all Times" in the class. She would first out a story to the children and then explain the moral of the story to the children and them explain the moral of the story and how to assimilate the lesson in their lives. She would also explain the meaning of the difficult words in detail. In time, She reduced the classes to four days a week, and finally by May 1951, to three days a week – Sundays for dictation, Tuesdays for recitation and Fridays for stories. Thrice a week Mother was taking a translation class with the senior students and sadhaks, and no Wednesdays She would take a class 'Prayers and Meditations' for our Group B. Thus She took classes everyday in the Playground of some group or the other. In 1954, the Mother discontinued the dictation classes on Sundays. Latter the recitation classes on Tuesdays were also stopped. But She continued with the Friday classes right up to 5th December 1958, after which She stopped coming to the Playground. This then is a brief survey of the Mother's work with the Group A children. I have seemed practical, in order to give a comprehensive picture of how meticulously she worked with the children. \We see the Mother working with the children, trying to in still into them the right values and attitudes and always aiming towards progress and a higher aim of life. She has time and again shown us that by regularity and discipline one can achieve everything without disturbing the routine activities of the day. It is quite interesting to note the date on which the Mother started classes for the Green group and the last date of the class. She started on 17th November 1950 (17th the last class on 5th December 1958 (5th December was Sri Aurobindo's Mahasamadhi day in 1950).